The Boy Who Cried Werewolf has divorced father Robert Bridgestone (Kerwin Mathews, The 7th Voyage of Sinbad) is on a weekend outing with his son Richie (Scott Sealey) to their cabin, when late at night they are attacked by a werewolf; the creature is killed, but not before biting the father, and no one is willing to listen when Richie tries to warn people that his own father has become a werewolf. The werewolf itself was somewhat contradictory: early in the film, it was chasing his own son in order to do him harm, but later it is nearly affectionate towards its’ sleeping ex-wife. Likewise, the werewolf takes the severed heads of its’ victims (in a backpack), grabs a shovel and buries it. Why is the feral, vicious werewolf using a shovel? It seems out of character. 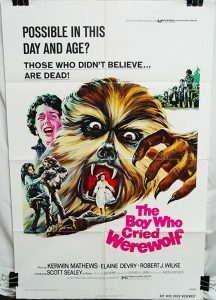 In all, The Boy Who Cried Werewolf is actually quite enjoyable. It begins with a divorced father (Kerwin Mathews) who takes his son (Scott Sealey) on a weekend camping trip to their cabin. While there, they go for a “moonlit” walk (again, it’s hard to tell the night scenes from the day scenes). When they’re attacked by a mysterious stranger. In the moonlight, the son realizes that the attacker is a werewolf. But the father who’s struggling with him doesn’t see that in the dark. 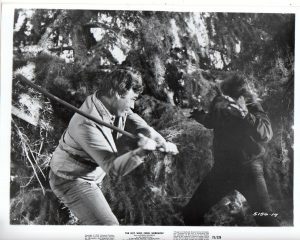 In the scuffle, the attacker falls off an incline and is impaled on wood, killing him — and reverting him to his human form. 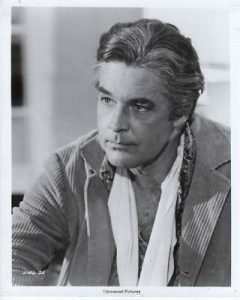 The father was injured in the attack, and after getting his arm bandaged, he informs the local sheriff (Robert J. Wilke) and takes the boy home to his mother (Elaine Devry) whom he clearly still has feelings for; the son tells everyone (the father, sheriff, mother, etc.) about how brave his father was fighting off the werewolf. But none of the adults believe the fantastic story … and his mother begins to worry that he’s making up the story about the werewolf to conceal the fact that his father killed, in self-defense, another human being. A psychiatrist (George Gaynes, Police Academy) recommends that the father takes the boy back to that same area, and force him to confront his fantasy, and begin to deal with the fact that his father ended a human life. However, they do this on the next full moon, and the father’s injury has, in fact, caused him to turn into a werewolf — looking like the original, and even attacking his own son, who initially thinks that it’s the original werewolf somehow come back to life. Soon, there’s a list of bodies piling up, with the son realizing that his own father has become a werewolf, and no one believing him. Also introduced at this point are the Jesus Freaks. When my daughter and I were watching, she thought they were generic hippies, but no. The Jesus Freaks are well-intentioned people who love God, preach peace and love wherever they go, and have a permit to camp in the woods — to the Sheriff’s consternation. At first, the viewer may be tempted to think that they’re just comedy relief. But they’re actually more than that, as the story unfolds. As things go on, the ever-helpful psychiatrist suggests that the entire family should go camping at the family cabin. Right before the full moon. And later on, the psychiatrist is the werewolf’s next victim. However, the family goes on their weekend trip ignorant of the psychiatrist’s death, stopping at the hippie/Jesus Freak campsite on the way. Led by Brother Christopher (Bob Homel), they are forming a sacred circle to drive away evil spirits. The family is invited to join them in the circle; Sandy thinks that it’s amusing, and she and Richie enter the circle — but Robert can’t; he’s blocked by an invisible barrier. By this point, Robert is already suspecting that he really is a werewolf, and this only confirms his suspicions. Sandy grabs her family and they’re back on the way to the cabin. Back at the cabin, the family settles down for the evening. Sandy starts to talk with Robert in a gentle voice. She confesses that she really has missed him and that they should get back together. The full moon rises, and Robert turns his back on her, silently walking away. In the shed he finds Richie, digging up the bag he had seen his werewolf father burying on their last visit. About to transform, Robert grabs Richie and begs him to lock his father in the shed. Richie does so, but just as he finishes, his mother sees him and hears the noises in the shed. She asks who is in there, and Richie tells her it’s his father. Sandy thinks that it’s a childish prank, scolds Richie and tries to open the shed. 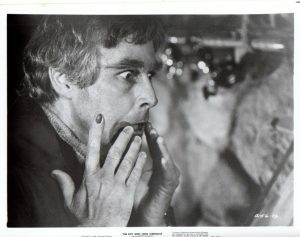 Richie screams at her just as a clawed hand bursts a hole in the shed door. Richie and his mother run to the car, escaping just as the werewolf emerges. The end is approaching rapidly, as Sandy and Richie tell the Sheriff about the attack — with everyone still ignoring Richie’s warning about his father the werewolf. The Sheriff and his deputies come to the cabin and drive the werewolf away. The werewolf, in turn, stumbles upon the hippie/Jesus Freak camp. The Jesus Freaks pray for the werewolf’s soul. And he turns back to human in front of them — and runs off. The hippies decide that it’s time to pack up and move on. They accidentally back their van into their large cross, breaking it off at the base. That night, the Sheriff and his deputies try to track down the creature again, as it kidnaps his son. They fire their guns at the creature, which don’t kill the supernatural werewolf. But it causes him to trip and fall back onto the broken cross, impaling and killing itself. But not before it’s had a chance to bite Richie.